In the islands, Dark & Stormies are a common quaff. Both rum and ginger beer are readily available, and their flavors complement each other nicely. Here on the mainland, though, ginger beer is a little less prevalent, which makes a Dark & Stormy a little more challenging to make. Unless…..
Well, you know how we feel about Domaine de Canton ginger liqueur, right? And as we continue to find new applications for it, our affections continue to grow. The Mainland Dark & Stormy consists of roughly equal portions of Gosling’s Dark Seal Rum, ginger ale, and Canton, making it possible to have a taste of the tropics anywhere, regardless of latitude. Check baby, check baby, 1. Oh, wait….that’s Wreckx-N-Effect’s 1992 hit “Rump Shaker,” not rum. Sorry about that. So here’s how the story goes….my friend bought a pineapple because his dad was in town and he thought some fresh fruit might be nice. But the pineapple didn’t get eaten, so he did the only thing that made sense: he went and got an assortment of rums to try with the fruit. First, we did a straight up tasting. 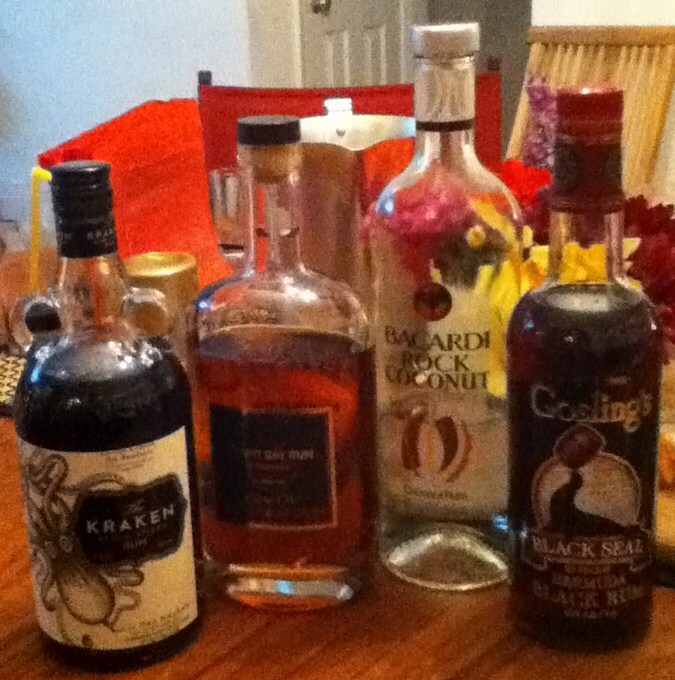 On the docket were Bacardi Coconut (which I declined….I already know what Bacardi tastes like), Mount Gay Extra Old, Gosling’s Black Seal (the sentimental favorite of our host), and Kraken. I found the Mount Gay to a very manly drink….kind of like a Manhattan. The Gosling’s was very smooth, and it’s easy to see how it’s a fave. But the Kraken….the Kraken was a delightful surprise. It seemed more like a cordial than a rum, smooth with a hint of vanilla. Plus, we love the label. We’ll surely be adding this to the minibar. 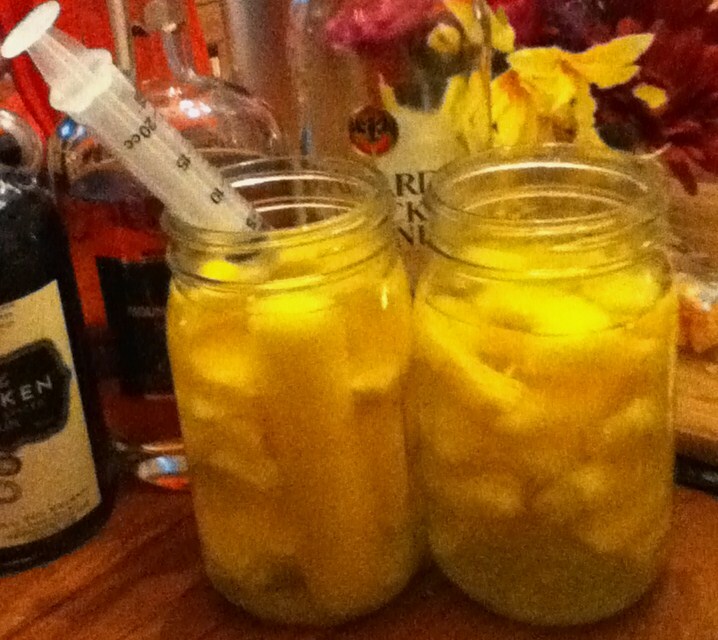 Then, we tasted the two pineapple extractions. (Yes, I know that everyone calls this sort of thing an “infusion.” But technically, it’s an extraction.) The Bacardi Coconut and a bottom shelf white rum were both tasted, and the pineapple was definitely a positive addition to both. Over the weekend, we had the pleasure of dining at Sbraga in Philadelphia. In addition to the very fine modern American cuisine, we had some delightful modern American cocktails. We availed ourselves of the fine bar while we waited for a table (and for her husband to park the car). I tried the Lady Day (Absolut Citron, Creme de Violet, blueberry jam, and bubbles), which was interesting; my companion had what she claims was a very fine dirty martini. (I’ll take her word for it.) While we were at the bar, a nearby drinker let me taste her Log Cabin, made with Knob Creek and Doulin-Rouge and with a maple-bacon rim. Tasty! We opted to do the beverage pairings with our meals. For me, that meant a Willamette Valley gewurztraminer, Rocca del Dragrone falanghina (possibly one of the finest wines I’ve ever tasted), a sangiovese/Montepulciano blend, and a lovely semillion for dessert. For my friend, it was a brut rose, a blended French burgundy, Saisone Athene beer, and an amontillado for dessert. For her husband (our driver), it was a glass of pinot noir with dinner, and a stunningly delish moscato with dessert. All in all, I’d give the bar an A+….Interesting and tasty a la carte cocktails, and perfectly selected pairings with meal. A little pricey perhaps, but worth every penny.